Home / Archive by category "How Kids Think"
I was subbing. The Kindergarteners needed to color the curve that was marked “1,” then the curve marked “2,” “3,” on up to “6.” To get the correct colors, students needed to refer to the legend at the bottom of the page: 1=purple, 2=blue, 3=green, 4=yellow, 5=orange, 6=red. As I explained the directions, I read the letters in each word, then the word itself, which they repeated. “B-l-u-e blue” and so on. I had been clear. So very clear. But as they started coloring, they asked the same questions. What color is 2? What color is 6? As the rainbow took shape, one child asked what color “3” was. Here we go again. I glumly quizzed her, “G-R-E-E-N spells….” She didn’t budge. I started the sounds. “Guh.. Rrrr…” “Oh, green,” she muttered and picked up a green crayon. The kid didn’t care about letters or reading, she just wanted to color. The bland word that I had insisted she read on the worksheet had now appeared on her most prized tool, a crayon. Now those scribbles of letters had value and power. Literacy acquisition was happening in real time for an entire classroom of kids. Suddenly, children were linking letters and known objects. Five minutes before, they had been passive students who wanted help with reading so they could color. They hadn’t seen how reading related to them. Now they were engaged in a Group Read of crayons, and the benefits were real to them. I’m sure that it wasn’t the first time that the kids had learned that big-kid symbols (letters) indicate actual objects. During this project, though, the children found that the magic of reading was literally in their hands, just waiting for them to discover it. I’ve mentioned that I use chess in my teaching. 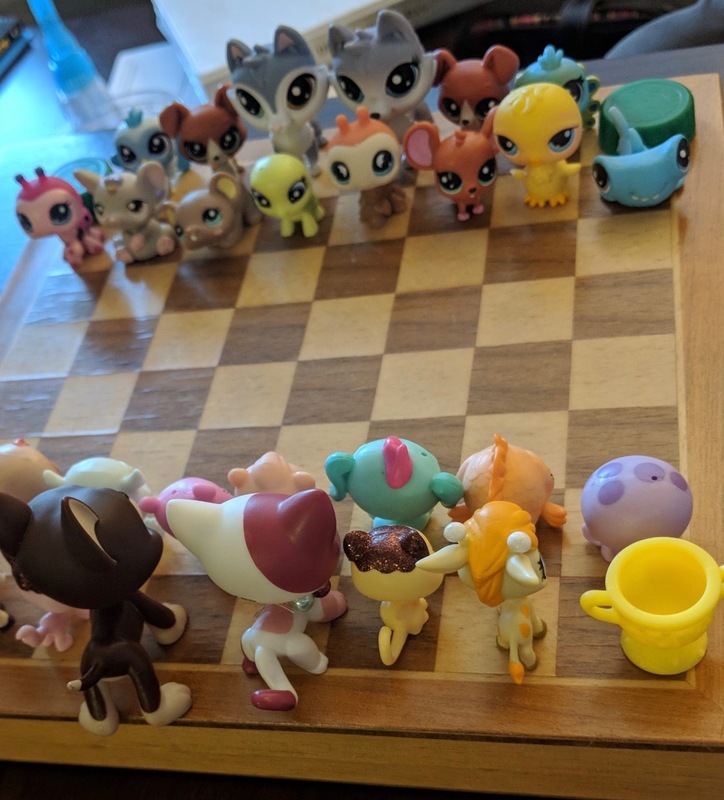 This week, a student decided that it would be much more fun to replace the usual figures with Little Pet Shop toys. A reluctant chess player, now she can’t wait for next week’s tutoring. 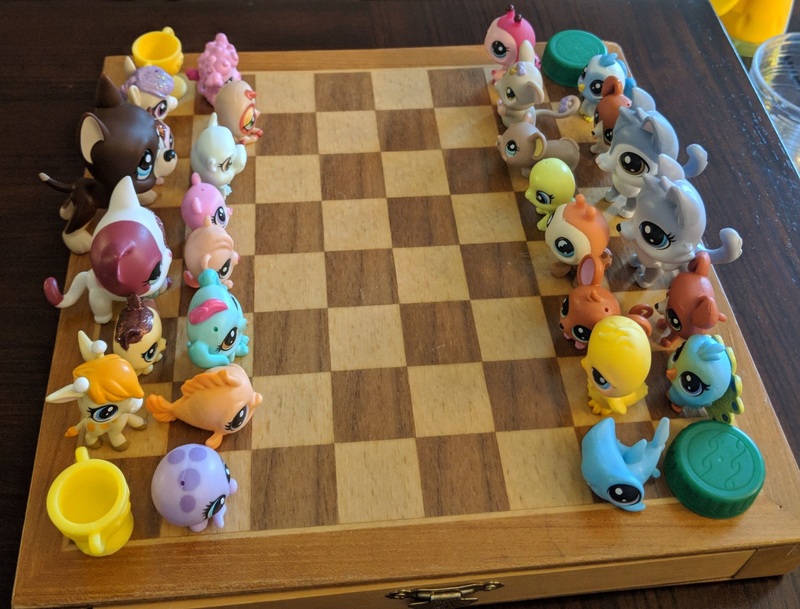 She chose each piece carefully, with cups and bottle caps as the rooks, matching figures for the bishops, the knights, and queen and king, little toys for the pawns. As long as they face opposite directions, we can remember who is on which team. The forces are ready for battle. A terrifying view from behind. Teach kids to wonder. Or just enjoy them when they do. We talk about the wonder of childhood. Sometimes as teachers, we create wonder in our classrooms. And sometimes wonder spontaneously generates, slamming through our scripted plans. Annabelle (not her real name) stared at the days of the week on her Kindergarten bulletin board. Her class had just sung its daily “Days of the Week” song to the tune of The Addams Family. My attention was on her peers who were charging off the rug after morning meeting. I certainly wasn’t wondering what anyone was thinking, especially a quiet kid. Slow down, Dawn. Before you answer, figure out what she means. Oh, I got it! She is unable to say “th” yet, so she’s spelling the way she speaks. I was seeing an early speller observe a word, compare its spelling and sounds to what she knew, note the inconsistencies, and problem-solve to find a better solution. Then she asked why her solution wasn’t the right one. Her classmate listened, engaged, and explained the phonemic convention. By the time I realized that this had been a cool moment, both kids had moved on to coloring. The time for teacher commentary had passed. It had been a random amazing moment in the classroom. Another quick encounter that I didn’t appreciate until after it was over. Argh, these supersonic moments of learning frustrate me. I want an Amazing Moments Warning System so that I can schedule them into my day. I want time to explain to the kids why their observations are significant. At the same time, I want to encourage this kind of inquiry in other students. How to do that? I already ask, “What questions do you have?” In this case, even if I had been specific, like asking, “What question do you have about the days of the week, which you say every single morning?” probably would not have elicited Annabelle’s musing. Her question came in the gut of the moment. Fortunately, she was confident enough to articulate what was on her mind. Should I have “Wonder Time”? “For the next four minutes, you can wonder anything. Look around the room, look out the windows. Write or draw what you’re wondering, then let’s talk about it.” Hmmm. I’d get oddball questions for sure. Guidelines and examples would help. But would Annabelle have come up with this question during Wonder Time? I kind of doubt it. However, maybe Wonder Time would help other kids to build the habit of articulating their own musings. I could also try to be ready with instant praise for the spontaneous moments. I hadn’t been ready for spelling analysis, so I just watched the moment pass. It would have been great if I had gotten the whole class’s attention and told them about Annabelle’s question. I could have empathized with her thinking. I could have admitted to the class that I still have problems with spelling. Yes, that would have been neat. But. Sometimes, the magic happens between kids and we’re just lucky to witness. In the middle of Addams family tunes, coloring shamrocks, and countless distractions, sometimes those moments of wonder burble out without us – and the whole point of education appears. And the Political Generation Is . . . ? There are people in this country who do not have a voice or national presence. They are getting ready for the responsibilities that will soon be theirs. They are not quoted by reporters, not discussed by employers. Every day brings them closer to the inevitable, when the world will be theirs. They are watching. If we listen we can hear them. My God, how much trouble are we leaving this generation of children? Not in recent memory has one generation been saddled with so much before leaving high school. They KNOW they’ll have to clean the environment, they KNOW there will be long-term fallout from this presidency, and 18 times this year, as of February 15, they know that they are being shot at school. The walls of school are not safe, the climate is not safe, and the government is not safe. And our generations have created it all. We voted in the administration, we pollute every day, happy for warm days in January, and at best shrug our shoulders about gun control. Sure we complain, but as a neighbor said to me, “What can we do about it?” She didn’t actually want an answer; she walked away when it looked like I might respond. These children will have to clean up all of our choices: we the Boomers, Gen X, even the Millennials. It doesn’t matter if our generations didn’t create the problems. We all need to show up and do everything we can to stop these problems. We must do more. This generation born after 2000 cannot solve everything. At this point, it looks like they’ll have to. They’re the ones dying from gunshot wounds, they’re the ones who will see Cape Cod swallowed by rising seas, and they’re the ones who will inherit an impossible national debt with paltry social safety nets. This generation talks about these topics every day. I hear their comments. They accept the problems as fact because they see fallout from the issues every day. They are learning to read by reading news and this IS the news. It’s all they know. From the way they’re talking, they may be up for undoing the damage done by us older generations. If we do nothing, they’ll have no choice but to try. Please, let’s take some of this off of their shoulders. Let’s be loud and involved and make this a world we’re proud of. We owe the kids that much. An odd inquiry. I hadn’t planned on asking her anything. I came up with, “Uh, which swing is the best one?” “The big one,” she answered. She smiled, then ran off. I substitute taught two or three times in her classroom last year. Not much. But questions to kids, simple as they feel to us, can make a difference. We adults can forget that consistent moments of simple questions can be memorable to kids. In their no-nonsense way of sizing up adults, which can intimidate the toughest teachers, kids can tell when we are giving them time. Kids care about those simple conversations. Do we remember a few adults who always spoke to us when we were kids? We may not remember what was discussed, but we remember seeing the grownups, and knowing that they were going to pay attention to us. Decades later, we still remember. If you’re reading this, you’re probably already comfortable talking to kids. But you can encourage other adults to spend a little time asking random questions – and building relationships – with kids. Executive functioning issues baffle many teachers and parents. Most of us live with lists and future dreads, which we can see in our minds. “If I don’t get this report done today, I’ll need to finish it on Mother’s Day. Guess I should microwave that frozen pizza for dinner tonight so I can crank out the report.” If we can arrange holidays and reports, why can’t our kid get out of the door without forgetting his backpack? Curious to know more about executive functioning, I attended a presentation by Sarah Ward of Cognitive Connections. It was hosted by the Ashland (MA) Parent Advisory Council. In addition to describing executive functioning, Ms. Ward talked about many strategies to address this issue. I was particularly struck by one: visualizing the end product. It turns out that kids with executive functioning deficits often can’t visualize what the rest of us can: the Mother’s Day party with us frantically scribbling that work report in the corner. Heck, these kids with can’t even visualize the finished report! 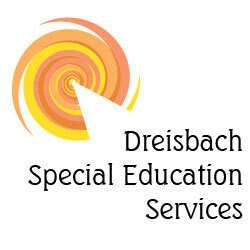 Isn’t it interesting that executive functioning’s deficit is autism’s strength? Remember my entry about Temple Grandin’s book, Thinking in Pictures? Her autistic brain gives her highly detailed pictures of end results, to the extent that she has difficulty explaining the pictures to other people. In contrast, people with executive functioning challenges have minds that give them lots of information, but no end results. As teachers and parents, we can help these students by giving them visuals of finished products. I already knew that final product visuals can be helpful, but they seemed like more of an “extra” to me. Now I see how critical final visuals are to some students. Also, engaging students in this process is particularly motivating. If those visuals include the kids themselves (picture of child in a backback, the student taking a photo with her phone of her neat folder), the tool is all the more powerful. If you are interested in Cognitive Connection and their upcoming events around the country, check out their website. In the meantime, talk a little less and photograph a little more. In special education, as well as general ed, we often conclude that we know how kids are thinking because they give us correct answers. Then we learn how they found the answers. When I told them that I was two, all three stared at me. I tried to entertain them further by explaining that these are the teeth that we’re born with on my home planet, far far away. But the kids had come to their conclusion. I was a grownup because I didn’t have baby teeth. Conversation over. I wondered, for a first grader, are teeth really the major distinction between babies and adults? Now that I think about it, on my second grade Christmas concert, my class sang “All I Want for Christmas Is My Two Front Teeth.” Yuletide tidings supplanted by teeth. It’s all in our perspective. Our students, our children, can arrive at accurate conclusions. We assume that their answers follow a logic that we ourselves use. These moments when we glimpse their thought processes can remind us that they see a pretty different world. How do we use this in daily interactions? Watch the kids. Listen to what they’re talking about with each other. Play with them and see how they respond. For special education kids, this is incredibly important. What are they getting? What do we think they understand that they are missing? Just because they can get from A to D doesn’t mean they went directly through B and C. Does that matter? It might. Taking time to ask, “Why?” and “How do you know?” can help us to understand how kids are thinking. We can learn which gaps need to be filled, or learn how to make better jokes to them in the future. If nothing else, now when I talk to first graders, I know to reference teeth.